The world has entered the Anthropocene. We are today a "big world on a small planet" where the economy exerts phenomenal pressure on Earth. There is no free natural capital left. All remaining biodiversity, freshwater, atmosphere, coral reefs, oceans, forests and ice sheets play a direct role in regulating the stability of Earth and thereby the economy. The trouble is, our economic system was developed, from Adam Smith to Keynes, when we were still a "small world on a big planet". When there were no frontiers and the idea of the global economy affecting the planet was seen as ridiculous. We could emit greenhouse gases for free, empty oceans for free, pollute polar regions for free, without risking invoices being sent back from Earth. This is no longer the case. In the 1980s the first invoices started coming back – the ozone hole, collapse of fisheries, tipping points in freshwater lakes, accelerated ice melt, shifts in heatwaves and storm patterns. And, as geopolitical fuel, the polluters are seldom the victims. Here are five ways the economy is failing people and the planet. Despite recognition by many economists, the economy remains frustratingly locked in the tragedy of the commons. Economic growth comes with unaccounted environmental costs and with it, rising risks of catastrophe. The economy remains unable to internalize real Earth costs. Today, the number one economic threat to humanity is our inability to value nature. This is not only about monetization. Sure, valuing natural capital and ecosystem services is critical. A global price on carbon is necessary. But it is - as science and myriad attempts have shown, not easy and not always possible (particularly to get the right price). So, valuing nature also means that we have to accept leaving the realm of economics. We enter the realm of ethics, inclusiveness and justice. 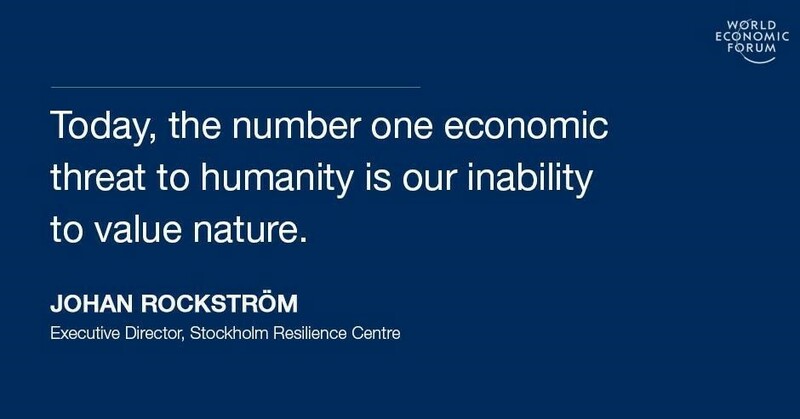 The Fourth Industrial Revolution can only succeed on a stable and resilient planet. We need to set planetary boundaries for world economic development. This requires political leadership. The markets cannot do it alone. Science clearly shows that human pressures on the environment follow a resilience path. When environmental resilience is high, change is slow, linear and incremental. Economies can exploit the environment with seemingly no or limited impacts. This is possible when we have abundant biodiversity, redundant atmosphere and glacial capacity to absorb greenhouse gases and pollution. When resilience has been drained following long periods of linear change, the environment can abruptly shift. 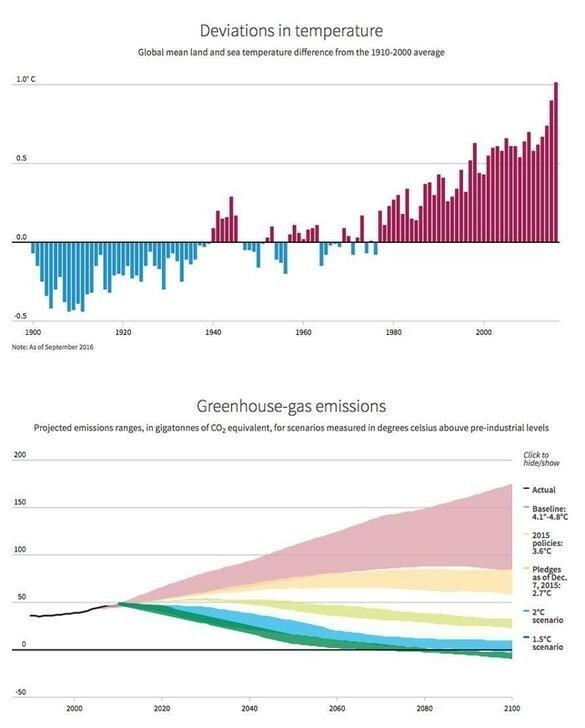 Tipping points are crossed, triggering large system shifts, often irreversible, potentially catastrophic. When costs for society go from predictable to non-predictable, from manageable to potentially infinitely dangerous, then we can no longer use market based discount rates to assess where it is most cost-effective to place our investments. In essence this means that in a non-linear world - where Earth sends invoices - the conventional economic theory falls apart. Our economic system builds on linear principles focused on throughput, optimization and cost-benefit efficiency. We exploit, create value, and then waste. There is no such thing as a Fourth Industrial Revolution with 9 billion thriving co-citizens in the world, if it is accomplished on linear economic principles. We need a transition to circular economic principles and practice. There is an old belief that solving environmental problems can only be achieved by first building enough economic wealth, so we can "afford to save the environment". This "Kuznets Curve" thinking has never been correct and must be abandoned once and for all if we are serious about economic development for a thriving humanity on Earth. The cynical truth is that it is only "thanks" to poverty that we do not have very dangerous climate change already. People in low income nations are responsible for far less emissions every year. Moreover, economic growth - as shown by Piketty and others, does not trickle down to the poor. An inequity aggravated by the fact that the economic wealth in the world so far is accomplished through unsustainable subsidies from the planet, while the cost for these subsidies are largely taken up by others, in general to poorest communities. And much less so for the stability and resilience of planet Earth. We are unable in our current economic system to incorporate long-term risk and value. We may, already when transgressing 2C, trigger the irreversible melting of the Greenland ice sheet. Not over decades but over centuries. This would subject future generations to a rise in sea level of 7-metres. Clearly, an unacceptable future. Still, the economy is unable to place any value whatsoever to long-term infinite and existential global risk. Under stable and incremental conditions, a free market economy spurs entrepreneurship, ensures efficiency and generates wealth. Those conditions no longer apply. Global risks are too high, and the benefits of transitioning to global sustainable development are not recognised. We are failing to create the right incentives on the market. Unsustainable behaviour still gives the highest returns. Global sustainability is now the only avenue to future inclusive progress that can deliver the Sustainable Development Goals and the Paris climate agreement. To succeed, we need to set planetary boundaries to create a safe operating space on Earth for the world economy – that is, confining the Fourth Industrial Revolution within social and environmental boundaries. This is not a way of grinding the revolution to a halt. It is instead a way of spurring deeper innovation and step-changes to a healthy, thriving global economy.